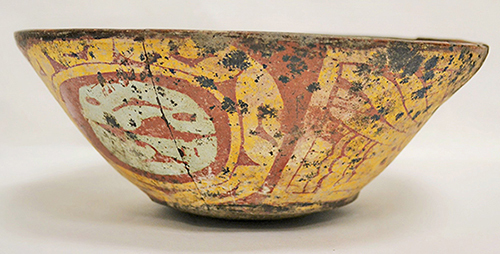 This bowl is from the West Mexican Shaft Tomb culture, which thrived during the Pre-Classic period (2000 BCE – 250 CE) in an area centered around the present-day Mexican states of Jalisco and Colima on the Pacific coast. Little is known about this ancient culture, except that the people buried their dead in shaft tombs—subsurface burial chambers cut into the ground that are accessed by a vertical shaft. These burial chambers often contain grave offerings of jewelry, weapons, textiles, and figures of people and animals. Most numerous, however, are ceramic vessels. Ceramic bowls like this one were filled with food offerings for the deceased. This bowl has very prevalent staining from the insects and bacteria in the shaft tomb where it was placed. These stains recently helped authenticate it. Additionally, it features a unique very pale blue color that is often found on shaft tomb ceramics, called pseudo cloisonné. This bowl is on exhibit for the summer in West Mexican Shaft Tomb Ceramics. You can learn more about the exhibit and the authentication process here. Research on this object was conducted by Lindsay Gilliland (’18) for her honors thesis in anthropology.